FOXBORO, Mass. – History has a tendency to repeat itself, and Friday afternoon’s matchup between Foxboro and North Attleboro was no different. The past four regular season meetings between the two sides have all finished very close; two by two goals (2014, 2015) and two by just one tally (2016, 2017). That trend continued this year as Foxboro used a pair of goals in the final three minutes and a big save from senior Jake Addeche to register a 7-5 decision over the visiting Rocketeers. In a see-saw battle that featured six lead changes, both sides had multiple leads erased. Neither team led by more than one goal until Foxboro added an insurance goal in the final seconds of the game. After battling back and forth over the first 36 minutes, the Warriors and Rocketeers entered the final frame knotted at 5-5. And despite combining for six goals in the third quarter, offense was hard to come back in the final 12 minutes. Addeche made the first big save just over four minutes into the frame, but his Rocketeer counterpart, sophomore Jake McNeany (eight saves), was equal to the task and made a huge save on a strong shot from Foxboro star Louis Piccolo (four goals) just two minutes later. North advanced the ball into the attacking half shortly after McNeany’s save and called a timeout. Foxboro’s defense stood strong through and didn’t allow North to get a good look, getting the ball back with just under five minutes to go. Foxboro eventually got possession back with just under three minutes left and called a timeout to set up the offense. Though they didn’t run a set play, the offense executed and gave the Warriors the lead. Sophomore Bobby Yerardi moved to the right as Pete Conley came over to provide a screen. Instead of a pick, Conley slipped past and both North defenseman stayed with Yerardi. The sophomore alertly flipped the ball to an open Conley in front and his bounce shot just went over the stick of McNeany to put Foxboro up 6-5 with 2:11 to play. 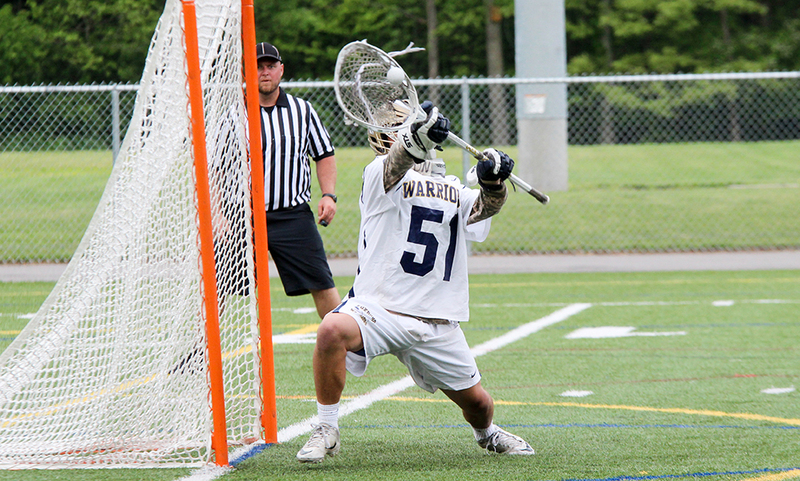 Foxboro’s Shayne Kerrigan won the ensuing draw and Foxboro was able to kill some clock in the offensive end. North was whistled for a 30 second penalty but its defense was still able to come up with the crucial turnover, getting possession back with just over a minute to go. North attempted to tie the game, setting up a play for defenseman Will Yeomans. The sophomore used a nice move to create some separation and ripped a shot from distance that looked destined for the top corner but Addeche made a huge stop to preserve the lead. Addeche then turned defense into offense, sprinting over midfield with the ball. With North just getting their man back from a penalty and down a goal, the defense was forced to press out. That allowed Piccolo to find some space and net his fourth of the game, giving the Warriors a 7-5 edge with 16 seconds to go. North had one chance in the final seconds but Addeche corralled a partially blocked bounce shot for his sixth save of the quarter and 12th for the game. Foxboro took the lead less than a minute into the game when Piccolo used a nice spin move to change direction and create space, firing it in to put the Warriors up 1-0. 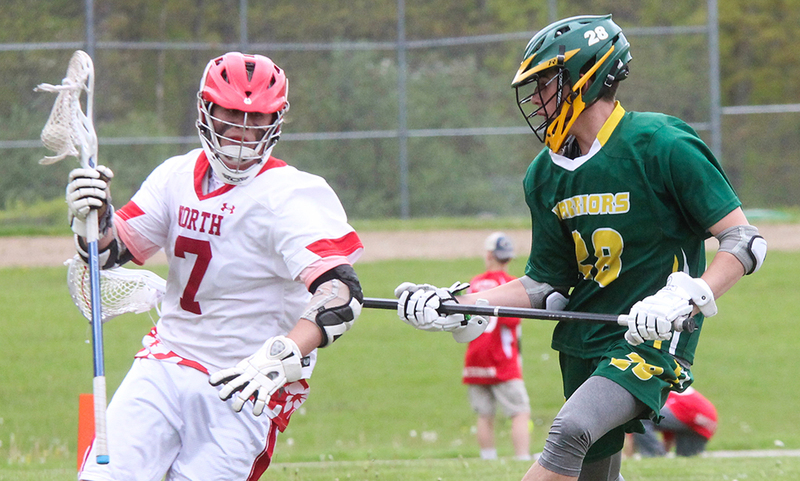 But North Attleboro senior Jason McNeany, who had a strong day at the faceoff X, won the ensuing draw and took it himself up the middle, firing the tying goal just seven seconds later. Big Red took a 2-1 lead when McNeany converted on a bounce shot with 3:20 left in the first quarter. Foxboro tied things up in the middle of the second quarter. With North down two men, Foxboro executed perfectly with Pat Kaveny finding Shayne Kerrigan in front for the tying goal heading into halftime. The third quarter featured more offense from both teams, both Foxboro and North Attleboro each finding the back of the net three times. Piccolo gave the hosts a lead just over a minute into the third but three minutes later, Jake McNeany made a save, tossed a pass to midfield to Yeomans, who took it the rest of the way and deposited into the back of the net to make it 3-3. Foxboro regained the lead when Piccolo used a fake pass to create separation and make it 4-3, but North came right back a couple minutes later and tied it off a goal from Damien Curtis. North then grabbed its first lead since the first half when Andy DeMattio curled around a screen right in front of goal to go up 5-4. Foxboro tied it at five apiece with 91 seconds left in the third quarter as Brendan Tully faked out his defenseman and snuck his shot under the bar. Foxboro boys lacrosse (5-0 Hockomock, 9-0 overall) is back in action on Monday when it hosts Bishop Feehan. North Attleboro (2-2, 5-3) will try to bounce back on the same day when it opens a three-game homestand against Attleboro. FOXBORO, Mass. – It was fitting that the first game played the recently dedicated Jack Martinelli Field had an old school feel to it. Unfortunately, King Philip played the role of spoiler, walking away with a hard-earned 16-7 win over Foxboro. Defense shined for both teams in the first game played on the grass at Ahern Middle School, the first regular season football game played there since it was named after Foxboro’s coach in August. King Philip punter Cole Baker averaged over 35 yards on his punts, his last pinning Foxboro deep in its own territory as it looked to complete a second half comeback. Foxboro punter Liam Foley averaged over 40 yards on his four punts, and the Warriors defense limited visiting King Philip to just 70 yards of offense in the second half. The longest drive by either team was 56 yards, orchestrated by KP quarterback Brendan Lydon in the second quarter, using eight plays to find the end zone. Foxboro’s offense didn’t run more than four plays on an offensive series until its last two drives of the game, the first ending in a turnover on downs, the second stopped by the end of the game. “If style points, we wouldn’t get any,” admitted KP head coach Brian Lee. “We’re playing pretty good defense though. And we’re playing pretty well on the special teams, Cole is doing a nice job kicking for us, putting the defense in good field position. KP forced a quick three and out to start the game and quickly put points on the board. After an eight-play drive only resulted in 19 yards, the Warriors trotted out Baker, who drilled a 31-yard field goal with 4:14 left in the first quarter. It looked Foxboro was ready to respond, starting with a 20-yard carry from Mike Henri (10 carries, 50 yards), a seven-yard carry and then a run that advanced into KP territory. But on that third carry, Aidan Bender forced a fumble on the tackle and Max Armour pounced on it to get the ball back for KP. KP had to punt the ball back to Foxboro after its drive stalled but with Baker placing his kick to the Foxboro 10-yard line, KP’s defense was in a good spot. Two rushes for loss and an incompletion resulted in a punt back to the visitors. Shane Frommer had carries of six, seven, eight and 12 to get KP into the red zone. But a big stop from Foxboro’s Patrick Kaveny resulted in a one-yard loss, and then Matt Pond stopped a run for a five-yard loss, forcing KP into a 3rd and 16. Lydon then tossed a perfect pass into the back of the end zone where senior Tom Madden hauled it in for a 25-yard touchdown. The extra point was low and blocked, giving KP a 9-0 lead with 6:24 left in the second quarter. KP took that lead into the halftime break. Midway through the third quarter, King Philip was pinned inside its 10-yard line and elected to punt on third down. Foxboro took over at the KP 35 yard line and needed four plays to cut into the deficit. A pair of runs from Henri (seven yards, three yards) sandwiched around a run from Anthony Capachietti (8 carries, 32 yards) set Foxboro up for 2nd and 7. Quarterback Devin Hassett elected to keep the ball on the option, raced out to the left side and followed a huge block from Teddy Maher around the edge to race for a 22-yard touchdown. Russell Neale’s extra point cut the deficit to 9-7 with 3:08 in the third quarter. Foxboro picked up some momentum at the end of the third quarter when Henri picked off a pass from Lydon. But on the first play of the fourth quarter, an errant snap resulted in a 13-yard loss and two plays later, Foxboro had to punt. The hosts got the ball back with 5:19 to play and started the drive with three straight positive plays. Back to back five-yard runs preceded a 14-yard completion from Hassett to Phil Dure. But a one-yard rush was followed by two incompletions. Facing 4th and 9, Foxboro originally sent out its punt team but then decided to send the offense back out. Foxboro had to take a timeout, leaving them with just three. But before they could get a play off, a flag for delay of game cost the hosts five yards. Armour, along with Kerr, Dylan Leonard and Jack Piller came up with a sack on the play, giving the ball back to KP’s offense. KP took advantage of the short field, using four plays with Kerr punching it in from five yards out with 1:29 to play to ice the game. King Philip football (2-0) opens Kelley-Rex division play next week when it welcomes Attleboro (0-2) to Macktaz Field. 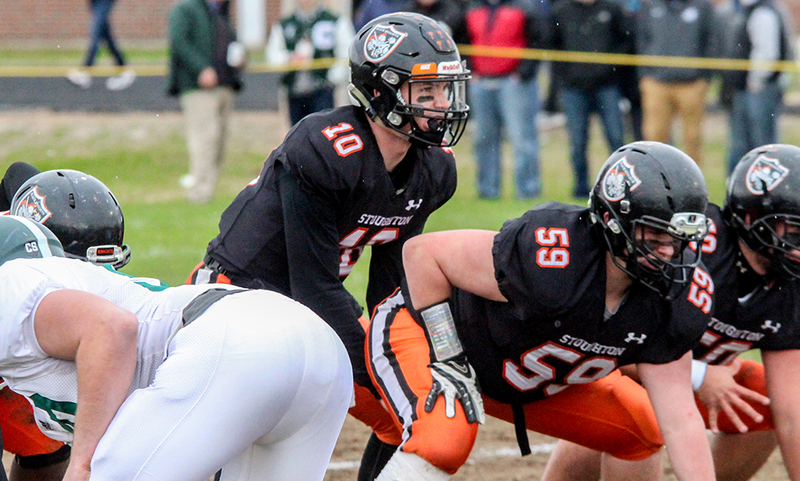 Foxboro (1-1) welcomes Stoughton to Jack Martinelli Field in its Davenport division opener. 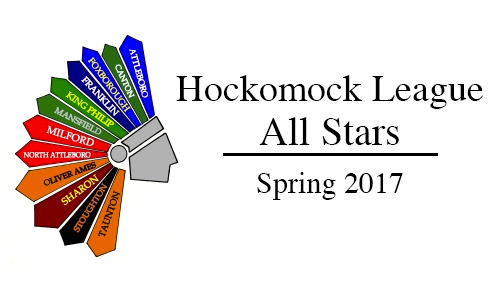 Click here for the 2017 HockomockSports.com Boys Lacrosse Awards. CANTON, Mass. – If there was one word that describes how Foxboro head coach Matt Noone wants his offense to play, patient would be near the top of the list. With limited depth, Noone stresses long offensive possessions that lets his defense get plenty of rest. On Monday night, the Warriors were able to convert enough of those long possessions into goals and limited the Bulldogs’ time on attack, especially in the second half, to manufacture a 4-2 win. Foxboro earned a pair of man-up opportunities in the first quarter but couldn’t convert on either chance. 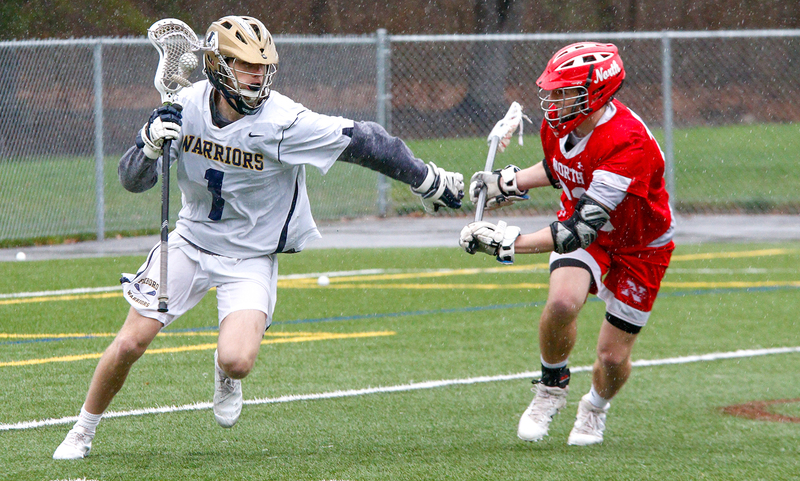 On the first chance, the Warriors nearly broke through when senior Trey Guerrini collected a pass in close and ripped a shot but Canton freshman Jack Connolloy (11 saves) robbed him with a point blank save. After neither side scored in the opening 12 minutes, Foxboro finally broke through with the first goal of the game. The Warriors were actually whistled for a penalty but forced a turnover and took control on offense. Sophomore Brendan Tully spun past his defenseman and found Guerrini right in front for an easy finish to make it 1-0. Foxboro’s goal seemed to give the Bulldogs a little but of a spark as Canton controlled the final four minutes of the half. Canton tied the game just over three minutes after giving up the first goal. Senior Ryan Lodge held possession in the corner and hit Griffin Roach – streaking in from the bench on a sub – in stride and the sophomore bounced his shot in to tie the game. Just over a minute, the Bulldogs netted their second goal of the game. Lodge once again held possession in the corner but this time, he eluded his defenseman, sprinted toward goal, spun past a second opponent and bounced his shot in from in close to give Canton a 2-1 lead at halftime. Although Canton took the momentum into the halftime break, it was Foxboro who controlled the entire second half. The Warriors took advantage of long possessions on the offensive end while allowing just three shots on net for the entire second half. Foxboro’s lengthy possessions finally paid off with two goals in the final four minutes of the third quarter. Senior Mike Moses faked his way around a defender and gained just enough space to tie the game with his shot with 3:44 to go in the third. The Warriors took possession once again and worked the ball around. With under a minute to play, their patience paid off once again. Moses fed junior James Silveria and his bounce shot through traffic put the visitors up 3-2 heading into the fourth quarter. Meanwhile, Canton registered just two shots total on goalie Jake Addeche in the second half. Foxboro netted an insurance goal just over the midway point of the final quarter. After another lengthy possession, Louis Piccolo fed Guerrini with a perfect pass right and front and the senior buried it with what was essentially a one-timer. 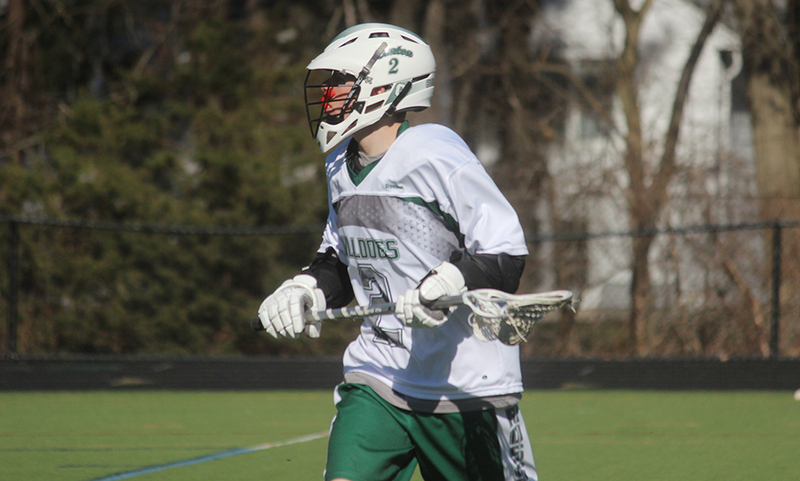 Canton had a couple of offensive possessions in the final minute but none resulted in a shot on goal – two resulted in turnovers because of poor passes and Foxboro’s Patrick Kaveny forced another. 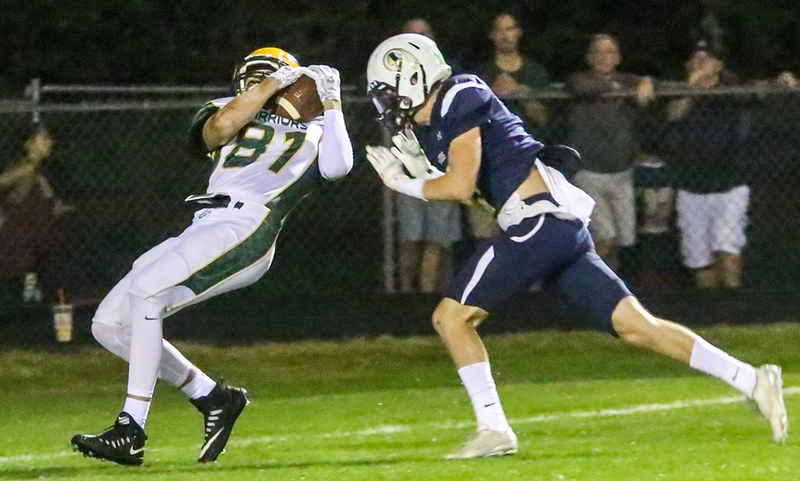 “They pressed out a lot, especially off ball and especially against our attack and we really didn’t handle it well,” said Canton head coach Bill Bendell. “We have pretty good attack so it was a little unusual for us. We tried to attack from the midfield in the second quarter, we did a great job of doing it. Then by the third quarter I think we were a little tired. They had some long possessions, they made us work. They do a great job of possessing the ball. When we got on offense, we were a little gassed by the end. Canton (4-2, 2-1) looks to bounce back the same day when they host North Attleboro in another key divisional showdown. The Bulldogs have won two Davenport division titles in the last three years and will be looking for a third in 2016. With a beefed up non-league schedule, Canton will be looking to make a deep run in the D2 South tournament this season. Canton will be relying on an experienced defense this season. Senior Chris Albert returns to the cage while senior Jake Ragusa and junior LSM Michael Pigeon will anchor the backline. Senior Dan Nadeau, junior Jonathan Sutton and sophomore Gabe Galeotos all saw time on defense last season and will fit in nicely again this year. 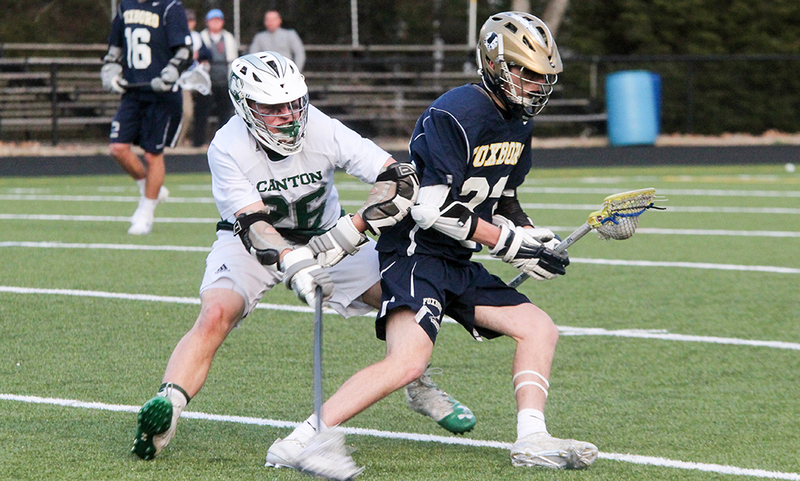 On offense, Ben O’Neill – one of the best offensive players in Canton history – enters the season with 125 career points. He’s got a high lacrosse IQ and can battle through defenses to find the net. Shaun Kirby, Dan Dillon, Bobby Mullaney and Eddie McCabe will all chip in with O’Neill offensively. Foxboro graduated a handful of talented players last season but the biggest loss might be losing last year’s leading scorer Pat McCarthy to a knee injury this year. But with five seniors and plethora of youth, Warriors will look to try and claim their first Davenport title since 2011. “You can’t replace Pat McCarthy, thankfully we still have his leadership, he will help the young guys,” Foxboro head coach Matt Noone said. 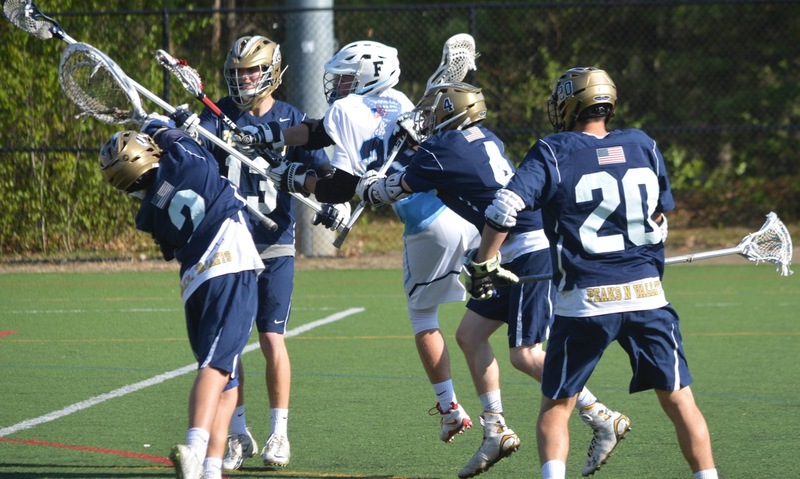 Foxboro will rely on Andrew Whalen, Louis Piccolo and James Silveria – all sophomores – on attack. McNamara will be complemented in the midfield by senior Austin Ryan and juniors Colin Spinney and Trey Guerrini. Noone called all three great athletes. Defensively, two year starters Tom Piccolo and Bobby Kierce will work alongside Buckner while sophomore Pat Kaveny has improved his game as well. Expect sophomore Jake Addeche and junior Tyler Silveria to battle for the starting goalie job. Milford will be looking to try and improve after recording just two wins in the 2015 season. New head coach Ralph Bono will try to turn things around in his first year at the helm. The Scarlet Hawks graduated their two top scorers from last season in Nick Mobilia (30 points) and Spencer Lawson (19 points) so there will be some questions to answer up front. In midfield, junior Alex Salamone registered 10 points last season and had 12 grounds balls while sophomore Andrew Gallagher made an impact with nine points in his rookie campaign. Jack Boyle, Nick Lurie and Ian Bucal all factored into the scoring last year as well. Defensively, Harrison Bliss led the Scarlet Hawks defensemen in grounds balls as a sophomore while Andrew Palaria and Riley Burns also saw time. In goal, Pietro Bon Tempo made 123 saves last year in 17 games played and should provide some experience in the back. After missing out on the playoffs last season, second year skipper Chris DiGiacomo will be relying on a large senior class to try to get back to the postseason. Senior attack Matt Gilson is back for his fourth year on varsity to pace the offense while senior Jake Aronson returns to man the goal for the Tigers. Senior captain middie Aidan Connly will be relied upon to take care of both ends of the field. Connly will be joined by classmates Mike Sullivan, Jack Long, Connor Howe and Max Bamford so the Tigers will boast a very experienced midfield. On defense, senior Max Sheldon will anchor the backline in front of Aronson. The Eagles are looking to get back to the top of the Davenport mountain and are hoping former Canton player Peter DeSisto will lead them there in his first year at the helm. After coming up just short in the division race last year, Sharon has a strong returning core to try to win the division for the second time in three years. Senior captains Mark Bloom and Craig Titus will be the focus of the attack again this year while sophomore Jon Greenberg will be back in goal after a terrific freshman campaign in 2015. UMass commit Josh Rotman will be paired with senior captain Matt Cancian in the midfield to provide a power 1-2 punch while sophomores Spencer Hall and Chase Waxman will also see a lot of time in the middle of the field. Sharon will have to fill some holes defensively but expect junior Jared Zunenshine and sophomore Zach Reingold to step in.